But before I continue with this post, I want to Thank Katie, over at Let's Add Sprinkles, for featuring my post, More Christmas Goodies and a Project!! from last week's Keep In Touch Link Party!!! 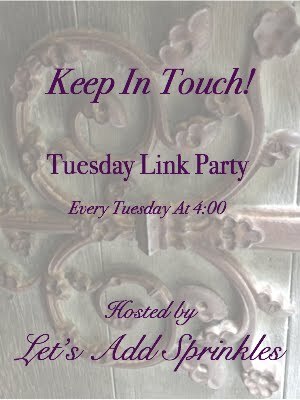 Please stop by and link up to this lovely party!!! Displaying some of my collection of Old World Santa's on the stairs has become a Christmas Tradition!! I have always loved how detailed they are!! I love the Post Office on it!! Especially since Joe is a retired Letter Carrier for the United States Post Office!!!!! Introducing Mr. and Mrs. James Barna!! WARNING!!!!!! Now Moderating ALL Comments!!! !